The term odontoma was first coined by Broca in 1986, who defined it as a “tumor formed by overgrowth of complete dental tissue.” They constitute about 22% of all the odontogenic tumors of the jaw. According to the WHO classification (2005), odontomas can be classified as compound odontomas and complex odontomas. They are composed of different dental tissues, including enamel, dentine, cementum and in some cases pulpal tissues. Odontomas are most common in first two decades of life. Exact etiology is unknown, but trauma, infection, growth pressure, hereditary, and developmental influences are thought to be the most favorable factors for its appearance. Radiographically, the lesion shows a well-circumscribed radiolucent image and generally shows a radiopaque border at its periphery. Compound odontomas have a similarity to normal teeth, while complex odontomas are irregular masses. 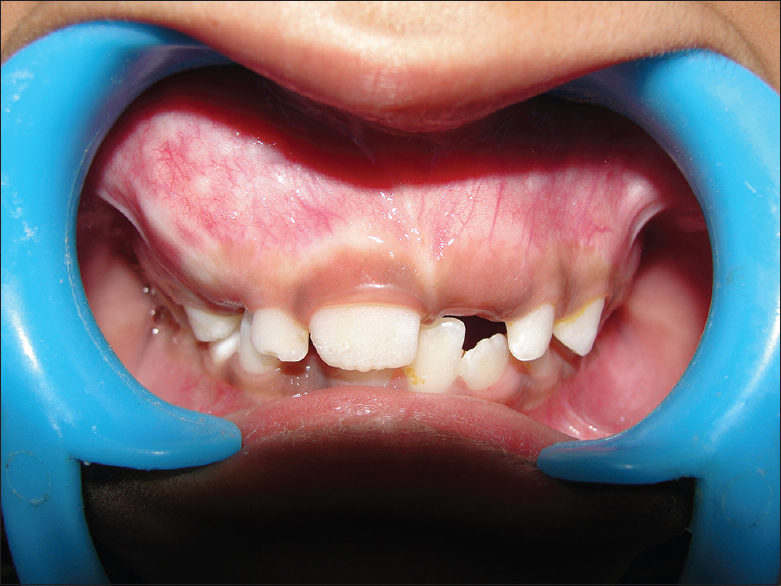 There are only few cases reported in literature where complex odontomas are associated with primary dentition, especially in children below 5 years of age. 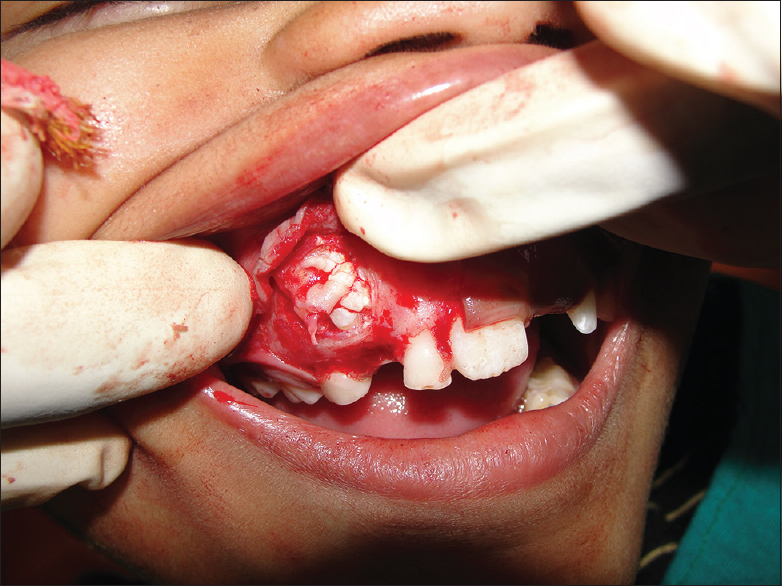 A 5-year-old boy reported to the outpatient department of pedodontics and preventive dentistry with a chief complaint of missing maxillary right primary canine. Extraoral examination showed no asymmetry. Intraoral examination revealed normal-colored buccal mucosa. Increase in the volume of the alveolar ridge with mild swelling in buccal bone and absence of the canine was seen [Figure 1]. 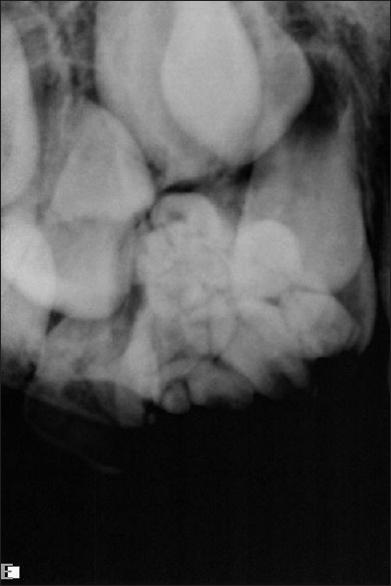 An orthopantomogram revealed an irregular radiopaque mass at the incisal border of the canine. Maxillary left permanent central incisor was also missing in the arch. For confirmation of the diagnosis, an intraoral periapical radiograph was advised in relation to primary maxillary right canine [Figure 2]. 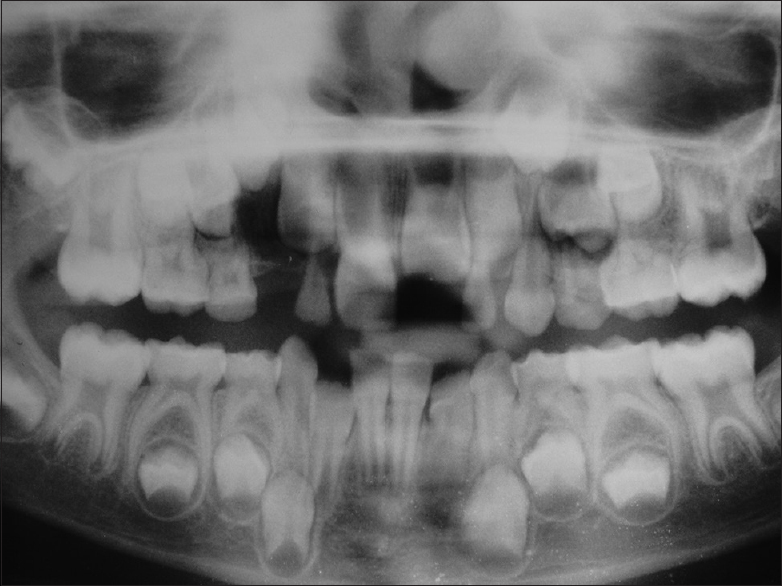 On the basis of clinical and radiographic evaluation, a provisional diagnosis of a complex odontoma in relation to maxillary primary right canine was established. Treatment was initiated with the enucleation of the lesion under local anesthesia. It was decided to extract the primary canine because it was impacted in the capsule of the lesion [Figure 3]. Following surgical removal, sutures were placed [Figure 4]. The patient was recalled after 5 days for the removal of sutures. Later, the lesion was sent to the pathological examination [Figure 5]. Clinical and radiographic examination was conducted after 1 month that showed a reduction of the alveolar ridge [Figure 6]. An odontoma is a tumor that has developed and differentiated enough to produce enamel and dentine. The second edition of the WHO histologic typing of odontogenic tumors classifies odontomas under the broad category of tumors containing odontogenic epithelium with odontogenic ectomesenchyme, with or without dental hard-tissue formation. Odontomas have also been classified as central odontoma (which are present inside the body), peripheral odontoma (which occur in soft tissue covering the tooth-bearing portions of the jaws), and erupted odontoma according to their clinical presentation. The complex odontomas are usually located in the posterior mandible, while composite odontomas are more often found in the anterior maxilla. Complex odontomas are seen less common in comparison with compound variety in the ratio of 1:2. Majorities of odontomas are asymptomatic, but sometimes pain, swelling, infection, and regional lymphadenopathies have also been reported in the literature. Radiographic characteristics are always diagnostic and characteristic. Radiologically, three different stages can be identified based on the degree of calcification. In the first stage, the lesion appears radiolucent due to lack of calcification and the second stage shows partial calcification followed by third stage that appears to be radio-opaque surrounded by radiolucent halo. Degree of calcification is less in primary dentition as in comparison to permanent dentition. Odontomas, both complex and compound, must be examined microscopically, to establish a definitive diagnosis. Histologically, they comprise varying amounts of dental tissues. In the present case, odontoma produced a small swelling of the cortical plate and the observed swelling was possibly related to the size of the lesion, since it showed 7–9 small tooth-like interior structures in the lesion. These internal structures were large enough to dislodge the primary canine and prevent it from eruption, which prompted the parents of the child to seek dental treatment. Conservative surgical excision is the treatment of choice for both complex and compound odontomas as they are well encapsulated and can easily be enucleated from the surrounding bone. In this case, because the primary canine was impacted in the capsule of the lesion and it could not be differentiated from multiple internal structures, it was decided to extract the tooth. 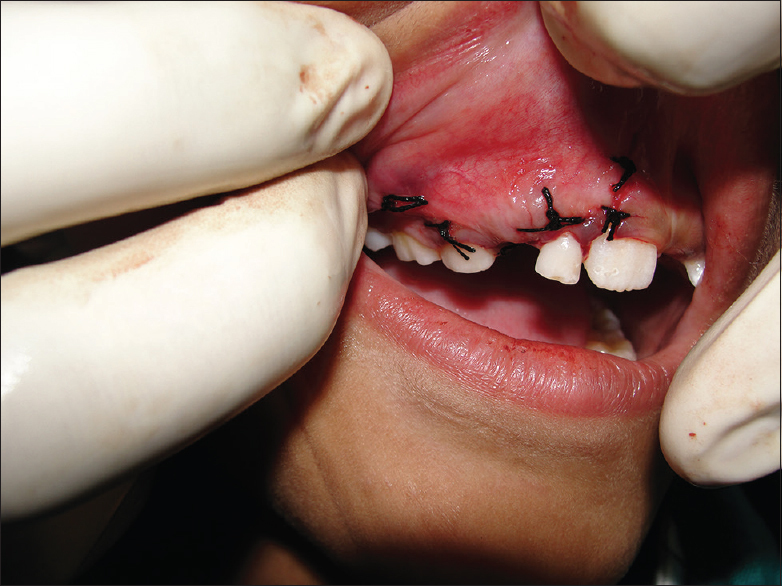 According to Kaban, odontomas are easily enucleated and adjacent teeth that may have been displaced by the lesion are seldom harmed by the excision since they are usually separated from the lesion by a septum of bone. As demonstrated by this case, early diagnosis of odontoma allows adoption of less complex and less expensive treatment and ensures better prognosis. 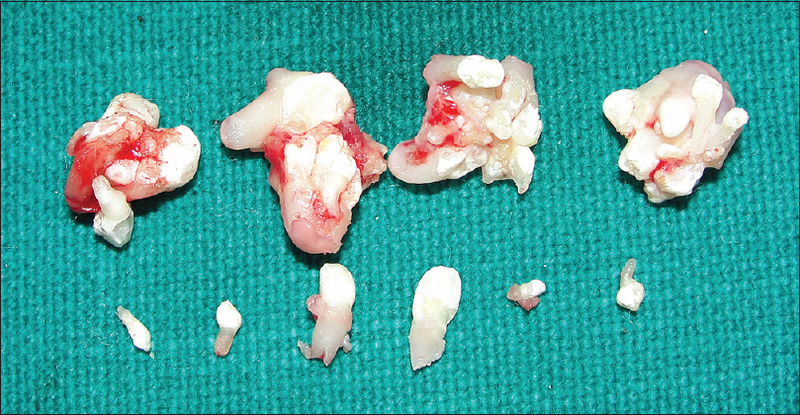 Kramer IR, Pindborg JJ, Shear M. The WHO histological typing of odontogenic tumours. A commentary on the second edition. Cancer 1992;70:2988-94. Tomizawa M, Otsuka Y, Noda T. Clinical observations of odontomas in Japanese children: 39 cases including one recurrent case. Int J Paediatr Dent 2005;15:37-43. Ferrer Ramírez MJ, Silvestre Donat FJ, Estelles Ferriol E, Grau García Moreno D, López Martínez R. Recurrent infection of a complex odontoma following eruption in the mouth. Med Oral 2001;6:269-75. Levy BA. Ghost cells and odontomas. Oral Surg Oral Med Oral Pathol 1973;36:851-5. Cohen DM, Bhattacharyya I. Ameloblastic fibroma, ameloblastic fibro-odontoma, and odontoma. Oral Maxillofacial Surg Clin N Am 2004;6:375-84. Kaban LB. Pediatric Oral and Maxillofacial Surgery. Philadelphia: Saunders; 1990. p. 111-2.